This set of pages is no longer being updated. This set of pages is dedicated to the men and women of AT&T Long Lines...the group who built a communications network designed to withstand World War III. Fortunately for us, they never had the chance to check it out. This page is mostly concerned with my Microwave Tower sites, although below there are a couple of other links to take you into more of the network's lore. AT&T Long Lines, later known as AT&T Communications, was the group of the Bell System that took telephone and data communications from one Bell operating company site to another. In effect, the local Bell companies were "short lines," or mostly concerned with local and intermediate calling, including the local loop from the central office to your home or business. Long Lines, however, was concerned with the maintenance of the longer circuits -- those connecting individual Bell operating companies, longer distances, and international calling. During its heyday, the AT&T/Bell System network went over cable and microwave. The vast AT&T Microwave Tower network has now largely been sold to American Tower, which will turn the towers into PCS and Cellular mounting surfaces. This site is dedicated to keeping those links alive, figuratively speaking, of course. 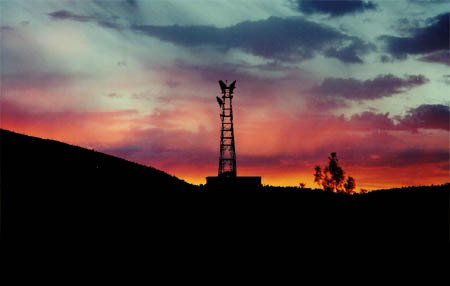 The AT&T microwave towers were used for both civil and government communications. They were mostly built in the 50s and early 60s, and moved the Bell System's long-distance communications off of copper wires for a large part of the network. Some communications went over transcontinental cables, others over microwave links. The buildings supporting the towers were hardened against a nuclear blast, and some of them in high-danger areas were underground. The towers themselves were engineered to withstand all but a close (within 5 miles) blast. The microwave horns were covered with a protective shield to keep out not only the elements, but also radioactive fallout. The buildings were shielded with copper to protect the equipment against the Electromagnetic Pulse associated with a nuclear explosion. Foot-thick concrete walls protected the vital electronics and people inside the base installations of these towers. Thick copper grounds went deep into the bedrock beneath each tower. Fallout showers, backup generators, sleeping facilities all existed to keep the network up in times of war. For forty years, from the time when the network was cutover until just this year, a good part of AT&T's transcontinental traffic went over those towers, and through the air...following a high frequency path from one point to another, amplified at each tower and retransmitted to the next one, until it was finally switched into the local telephone company's central office, and from there to your home. 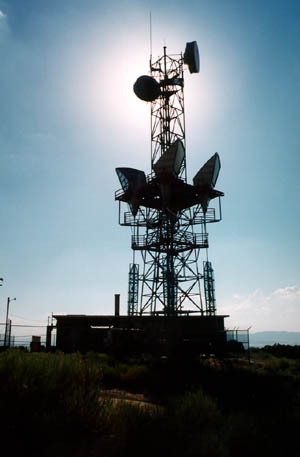 In their heyday, the towers and their microwave paths formed a network that wove the United States together in a cohesive telecommunications web. Before the towers were built, and automatic switching was put in, long distance calling was a great deal more difficult. After the network was installed, it became suddenly second nature, and a good deal less expensive. In this part of the country (the West), the towers are on top of mountains, in valleys, and in the middle of cities. A good many microwave circuits still remain...in fact, with cellular communications, a lot of cellular calls actually transport over microwave to get to a cell tower. Ultimately, the thing that killed the Long Lines towers was the demand for bandwidth. A microwave link can only carry a small percentage of the capacity that a single fiberoptic strand can carry...and with the explosion of the Internet, it means that bandwidth is king. As AT&T replaced more and more of the old network with fiber, the towers became more valuable as towers that could be rededicated to cell sites...and so they have been given a new life. I was inside one of the towers, and saw an AT&T motto on the wall. "Communications is the foundation of democracy," it said. Never was a more true statement made. A nation that hopes to be a responsible republic or democracy requires free and open communication for survival, both political and economic. 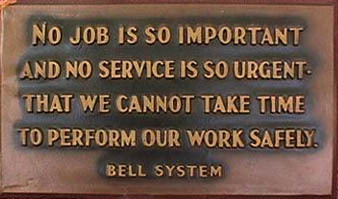 I repeat the motto here because it shows the great degree of dedication present in the old Bell System, and particularly in the group that was known as AT&T Long Lines. Flagpoles adorned each manned installation. Crews knew that their job was ultra-important. If nuclear war hit, they likely would leave their hardened facilities and find their families long gone. This group truly was an organization dedicated to their motto. The location links below take you to a page (or in some cases just a picture) of a Long Lines microwave site in Utah. Most pages have a short description of the site, along with any information that I think I know about them. I grew up watching these sites, and this has been an interesting excursion into the lore of Microwave towers. Below those links are off-server links having to do with related items. "We have proved to the world and to ourselves that it is not the size of an organization but the will that animates it, that determines its responsiveness to the times."